Take the Lead Horsemanship, LLC is owned and operated by Amy Hoelscher. Amy started riding western from a very young age, and took English lessons at age 12. Growing up, she was a member of 4-H and FFA, competing in numerous events from western pleasure and hunter under saddle to reining and contesting. Amy worked for a Quarter Horse breeder out of high school, learning nutrition and care for foals, broodmares and stallions. Throughout her college career at Columbus State, she worked for a boarding and lesson facility teaching students ages 4 and up. During this time she also had the opportunity to intern at The Ohio State Veterinary hospital and the Cleveland Equine Clinic and was a 4-H adviser for 6 years, helping children learn about riding and showing. Having completed her degree in 2010 as a Registered Veterinary Technician, today Amy continues to attend several clinics and seminars as a way of continuing her education with horses. She believes you can never stop learning, and every day you can improve your skills as a horseman or horsewoman. In 2016, Amy earned her judges card for the Ohio 4-H Horse Show Judges program. 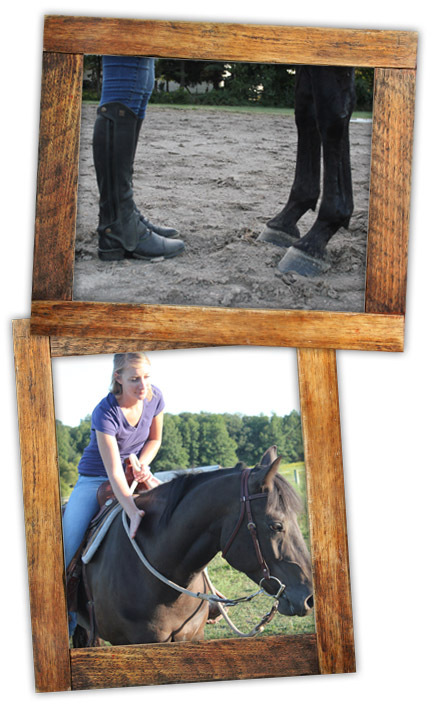 In her career as a trainer, Amy has worked with several horses from start to finish and made them into successful show, trail, and companion horses. She believes in working with the horse to earn their trust and respect. Amy attributes her success with horses to the great horsemen who she had the privilege to ride and attend several clinics with—Richard Shrake, Colleen Kelly, Lynn Palm, and Ken McNabb —to name a few.